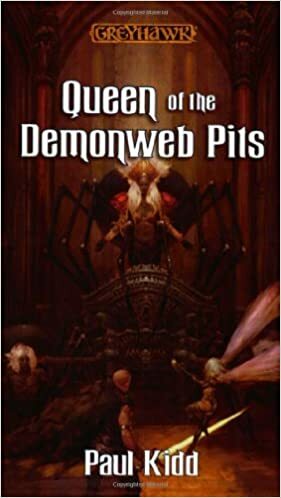 Revisiting classic adventures has been extremely successful.Queen of the Demonweb Pits was one of the most popular adventures ever created for the Dungeons & Dragons game. This novelization appeals to those who have played through the adventure, as well as to those who have an interest in drow elves--one of the most popular races in the game. try and keep his wits. The dazzle had shown a darker spot in the cavern floor. Jus blundered forward. The spot was almost directly beneath Tielle. He found a metal grill and grabbed it in both hands, bending all his strength against the bars of steel. The iron bent. With Tielle right above him, Jus had no time to take a breath. He squeezed his bulk through the grill and found himself in a vertical tunnel. His ears popped as he plunged down into absolute pitch darkness. The pipe bent sideways.